Alec and Hilaria Baldwin had a blast on Day One of the 2017 US Open! The married couple watched Maria Sharapova of Russia during her first round Women’s Singles match against Simona Halep of Romania at the USTA Billie Jean King National Tennis Center on Monday (August 28) in New York City. They were joined by Lin Manuel-Miranda, Pharrell Williams, Mike Tyson, his daughter Milan, Keegan-Michael Key, James Blake, Caroline Boyer, Luke Bryan, Vera Wang, Megyn Kelly, Martha Stewart, and Katie Couric. “Team adidas 🎾” Pharrell captioned the Instagram photo below. ICYMI, Alec made a special appearance on the final episode of Saturday Night Live‘s Weekend Update: Summer Edition to reprise his Emmy-nominated role as President Donald Trump. Alec parodied Trump‘s recent rally in Arizona and joked about the president’s response to the violence in Charlottesville, the solar eclipse, and the firing of Steve Bannon. Alec Baldwin is joined by his wife Hilaria as they attend the SummerDocs series screening of Trophy during the Hamptons Film Festival on Saturday (July 29) in East Hampton, New York. The 59-year-old actor looked handsome in a navy blazer while his 33-year-old fitness guru wife showed off her svelte figure in a little black dress. Earlier that day, Hilaria took to Instagram to share a super adorable video of their son Rafael, 2, on a boat ride. Alec and Hilaria Baldwin have reaffirmed their love for one another! The couple renewed their vows in honor of their fifth wedding anniversary on Friday afternoon (June 30) at Wolffer Estate Winery on Long Island, New York. According to Extra, Alec and Hilaria were surrounded by friends and family, including their three children – Carmen, 3, Rafael, 2, and Leonardo, 9 months. “I see what I have and I’m very lucky. We’re getting remarried on Friday,” Alec spilled earlier in the week. Demi Moore rocks a floral suit as she arrives at the premiere of her upcoming movie Blind on Monday night (June 26) at the Landmark Sunshine Cinema in New York City. The 54-year-old actress joined at the premiere by her co-star Alec Baldwin and his wife Hilaria. Joining Demi and Alec at the premiere included their co-star Dylan McDermott and his fiancee Maggie Q, Dan Amboyer, John Buffalo Mailer, and director Michael Mailer. Blind hits theaters on July 14. Watch the trailer for the movie below! FYI: Demi is wearing a Gucci suit and Moscot glasses. The party was sponsored by Bagatelle New York, Day Owl Rose, Foster Grant Sunglasses and Essentia Water. Guests sipped on Casa Noble Tequila. Alec Baldwin‘s family and friends all stepped out to support his big performance! The 59-year-old actor took part in Spike TV’s One Night Only special on Sunday (June 25) at the famed Apollo Theater in New York City. Alec was joined by his wife Hilaria as well as his brothers Daniel and Billy. His 30 Rock co-stars Jack McBrayer, Jane Krakowski and Tracy Morgan also attended the taping to show their support. During the show, Hilaria took to her Instagram to share a sweet photo of their daughter Carmen with Alec‘s older daughter Ireland. Public Theater's 'Julius Caesar' Gets Star Support After Delta & Bank of America Pull Sponsorship! 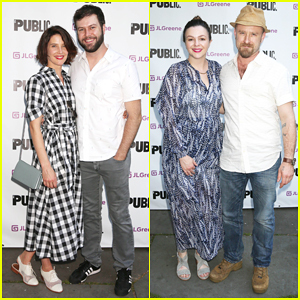 Cobie Smulders and her hubby Taran Killam stepped out to show their support for The Public Theater’s Shakespeare in the Park production of the play Julius Caesar held at Delacorte Theater on Monday (June 12) in New York City. It was recently announced that Delta and Bank of America have both pulled their sponsorship money from the classic play, which has been re-imagined in this new contemporary staging with Caesar being a character who resembles current President Donald Trump. Andrew Rannells, Amber Tamblyn, Ben Foster, Alec Baldwin and his wife Hilaria Baldwin, Ari Graynor and Corey Stoll also were in attendance.